Funeral director David Bray decided to mark his 30th anniversary with the family business, R J Bray & Son, of Wadebridge in Cornwall, with a significant milestone, so last summer he launched the Bray Charitable Fund to benefit organisations and groups in the local community. 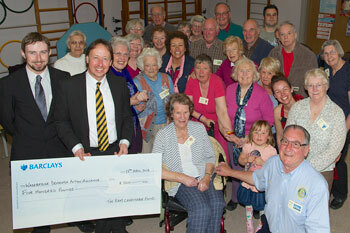 David and his son James have just presented the fund’s first cheque – £500 for The Wadebridge Dementia Action Alliance. The charity works to make the local area a place where people living with dementia and their families have the support they need to lead the life they choose, and are enabled to contribute to the life of the town. The donation will help the alliance to provide dementia awareness information sessions, which promote positive approaches that help people living with dementia to have a good quality of life. The pair made the presentation at a ‘memory café’, which offer an informal setting for those affected by memory problems, and their carers, to access support and information. David said: "This is the first cheque presented from the fund and, through our own family experience, as well as caring for families whose relatives are affected by dementia, I know what good work is being carried out by the Alliance. “We are also proud that everyone at R J Bray & Son has attended a trained course hosted by the Alliance and have become ‘dementia friends’. James and David are pictured with helpers and guests at the memory café.